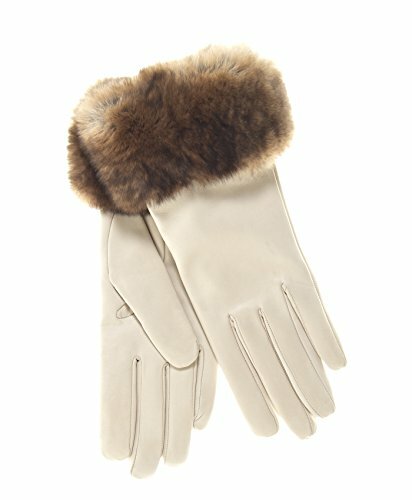 In addition to the cozy warm 100% Italian cashmere lining, and the finest Italian lambskin shell that all our Fratelli Orsini fine Italian women's gloves have, these super luxurious gloves have a 100% genuine Orylag rabbit fur cuff, a new breed of rabbit from France with a coat similar to chinchilla. Both light and warm, soft and silky, fine (15 microns) and incredibly dense (8000-10000 hairs to each square centimeter), it is naturally luminous and beautifully shaded (see Orylag website for more information.) Our softest, plushest, most beautiful rabbit fur yet! Made in Italy by Fratelli Orsini. SIZING HINT: These gloves run true to size.